Covering all of the latest in algae and bio-film control technology from the people who know what's in your pond, AlgaeControl.US- a divison of South Santee Aquaculture, Inc.
We LOOOOVE Mapping Marine Life! As you probably have figured out by now, we LOOOOVE mapping marine life. That's why today we bring you yet another cool way to use maps when researching aquatic life on earth. 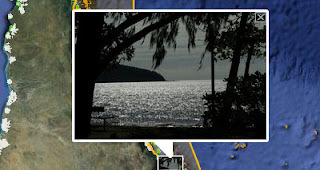 A lot of times, we like what Google Maps Mania digs up. For example, take a close look at World Database on Marine Protected Areas. Did you know that only 0.7 of the world's oceans are protected? The WDPA-Marine wants to provide the most comprehensive set of marine protected areas (MPAs) data available. Part of this effort involves a very cool Google Maps mashup that provides information about the less that 1% of protected ocean. The map uses shaded polygons to highlight protected ocean areas. For each protected area it is possible to select a number of layers showing coral, mangrove, seagrass and saltmarsh locations. The map also includes layers to display Wikipedia articles, photographs and videos of the selected protected area. Do you have a map that you'd like to share with us? We'd love to hear about it! As you probably know by now, we like maps. 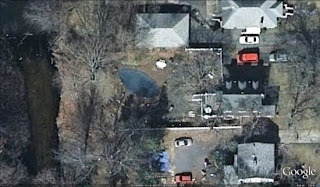 This is yet another awesome map trick-this time involving location of Illegal Pools (found via GEarth Blog). Apparently illegal pools are frowned upon up north, as the town of Riverhead, NY, located on Long Island, has recently started using Google Earth to track down backyard pools that don't have the proper license. Wanna Know How to Get Rid of Geese (without a shotgun)? 1. Disrupts geese sleep patterns causing them to move to another pond. What is Away with Geese? Away With Geese is a simple, compact, and maintenance free way to control Canada Geese on lakes and ponds, effectively eliminating problems of droppings, aggressive behavior, and damage brought by nesting geese. Unlike other methods used to deter geese, such as: chemical sprays, physical barriers, noise devices, trained dogs, and hunting, Away With Geese has no adverse affects on its environment or humans. Furthermore, it will not tarnish the natural aesthetics of the lake or pond it is protecting. The device is comprised of a solar powered light that flashes once every two seconds, mounted on a flotation device, which is anchored to the bottom of the afflicted pond. The flashing light discourages Canadian Geese from foraging and nesting, causing them to leave and move on to another lake or pond. 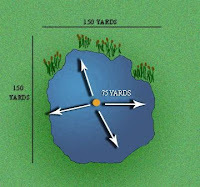 The compact device is not only harmless to the environment and ecosystem of the pond, it also is visually innocuous, measuring a mere 15 inches wide and 12 inches above water line. Once Away With Geese is on duty, no work is required to maintain a Canada Geese free environment. The installation takes five minutes, the light is solar powered, and the housing is factory sealed and impervious to weather conditions. It is really a grounds keeper's dream. There is a One Year Warranty that covers manufacturing defects. 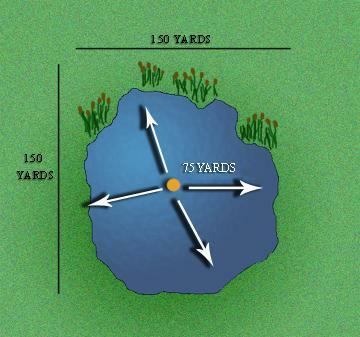 The Away With Geese product has an effective range of at least 75 yards in any direction. One unit will service a pond that is up to 3.5 acres in size (about 450 x 450 feet) provided that all areas of the pond are within line-of-sight of the Away With Geese light. Some ponds may have inlets or bays where Geese can hide in the edges of the pond. 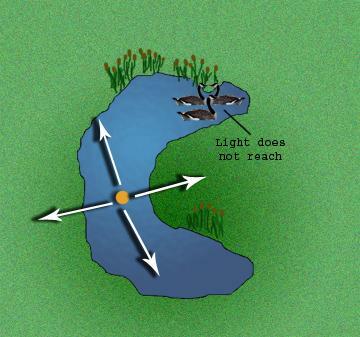 In order to have the light reach these areas, special care must be taken when placing the Away With Geese unit so that hidden areas of the pond are within line-of-sight. You can purchase Away With Geese from the South Santee Aquaculture Store in the toolbar below. This is the first in a series by South Santee Aquaculture about the various was for calculating the size or volume of a garden pond. 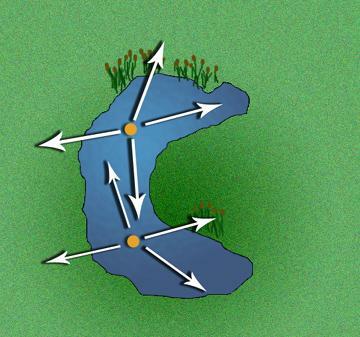 Remember that water volume is calculated much differently based on the shape of the pond. So...if the water depth is not the same for the entire pond, estimate the average depth of the water for the pond and use that number for the depth. 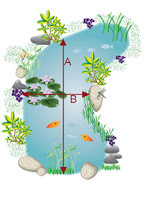 Why is Calculating Pond Size Important? The calculation of the size and volume of your pond is important to virtually every aspect involved with keeping it well maintained, such as the fish you buy, how to control aquatic life, staying on top of important cleaning tasks and when purchasing fountains or aeration devices. What about Calculating size of Irregular Shaped Ponds? 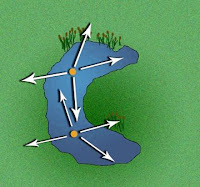 This one is a little bit trickier and we will go into some advanced methods of calculating odd or irregular shaped ponds in the near future. However, what I will tell you is Irregular shaped garden ponds are calculated using "squares". This is a bit tedious done manually but with the help of South Santee Aquaculture it can be greatly simplified and the results for your garden ponds volume are very accurate when care is taken. Contact us with questions about your pond. Pond Volume = Surface Area x Average Depth. The challenge lies in calculating the surface area accurately which is easy if the shape is a square or round say. But for complex shapes an estimate of area has to be made using the "count the squares" technique. Here is a nice way to stay on top of the various maintenance tasks involved with having a healthy garden pond-our yearly pond maintenance calendar! 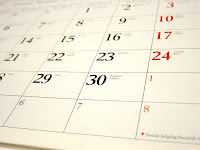 Add this calendar to your iGoogle or subscribe by email and it will automatically send you an alert to your email on the days that you have new tasks that you should focus on, when keeping a well-managed pond environment. On our end, we will maintain this calendar as well, adding important notifications and tips for keeping a well maintained pond as they become available. Maintaining a clean, healthy and sustainable pond environment has never been so easy! If you have any questions or concerns, just drop us a line on our website. South Santee Aquaculture is dedicated to promoting safer and heathier solutions for aquatic environments. AlgaeControl.US, based in Charleston, SC is the Master Distributor for Sonic Solutions LLC ultrasound algae control devices. We currently have over 50 authorized dealers worldwide providing you a wide variety of expertise; from water garden experts to pond and lake biologists to industrial wastewater engineers. Using sound “green” water management practices positively impacts everyone’s water quality and helps protect and preserve our environment, fish and wildlife. Become our Fishing Buddy on Facebook!